These are on-line versions of Ruslan Russian 1 and 2 for PCs including Apple Macs, iPads and all suitable tablets. It will also work on many phones. The programs include all the Ruslan 1 and 2 dialogues, texts, songs and poems with full sound and vocabularies as well as the Ruslan 1 video animations, texts and songs. There are 1200 interactive exercise screens, many with sound and pictures. There are translations, dictations and tests. This is a full version of Ruslan Russian 1 and 2 for independent study or as an effective and flexible backup to a course with a teacher. The first lesson of Ruslan 1 is free of charge. Ruslan Russian 1 Lessons 2, 3, 4. Ruslan Russian 1 Lessons 5, 6, 7. Ruslan Russian 1 Lessons 8, 9, 10. Ruslan Russian 2 Lessons 1, 2, 3, 4. Ruslan Russian 2 Lessons 5, 6, 7. Ruslan Russian 2 Lessons 8, 9, 10. Login and password will normally be emailed to you the same or next working day using the email address that generated the payment. If you want the login to apply to a different email address please notify enrol@ruslan.co.uk at the same time as you make the payment. The DTI prizewinning Ruslan CDRoms were produced between 2000 and 2010 for 16 bit and 32 bit versions of Windows. They worked brilliantly with Windows XP and a full range of programs was produced for the three Ruslan levels, as well as some other more advanced modules. You can find all these in the webshop. 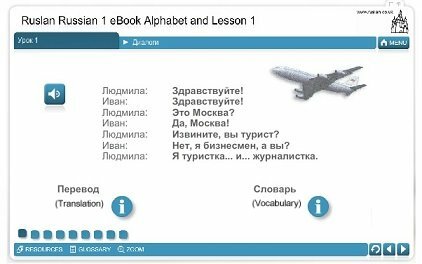 These are fully interactive versions of all three levels of the Ruslan Russian course, with a large number of additional exercises and a lot of additional recorded material. There are also French versions of Ruslan 1 and 2 and Swedish and German versions of Ruslan 1. Please see the Webshop for details. These programs were produced for Windows XP etc. and usually will not work with newer 64 bit versions of Windows. If in doubt, please try the free demo first lessons . Now that as Windows XP is no longer fully supported by Microsoft we cannot guarantee technical support. There are however a large number of tips and suggestions on the Ruslan CDRom troubleshooting page . For real books, audio CDs and DVDs go to the Webshop !